Crikey correspondent Bernard Keane explains capitalism, identity and Why Everything Is Awful A tide of populism and xenophobia is sweeping the western world. Disillusioned voters are turning to political outsiders and increasingly rejecting the liberal economic solutions of out-of-touch elites. Despite having access to more information than at any time in human history, we are turning our backs on experts, evidence and facts themselves in a new Era of Electronic Ignorance. Many warn darkly of a repeat of the chaos, misery and war of the 1930s. How did it all go so wrong? The Mess We're In explains how a perfect storm of historical developments has left us fearing that a Dark Age is fast approaching. How the triumphant economic philosophy of neoliberalism has failed us and provoked a backlash that is sweeping it aside. How the internet is rewiring our economies, our media, our culture and even our own brains. How politics has become a hollowed-out industry of self-interest rather than a public service. And how, together, they've unleashed a wave of anger and fear that has engulfed the world. But don't panic, says Bernard Keane: things are also better than they seem to be. 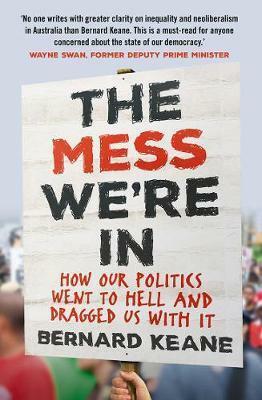 In this fascinating, entertaining and occasionally maddening book, he points to how we can fix things - and also how Australia can lead the way.